December 2015 MG Stocks & Screens Now Available! 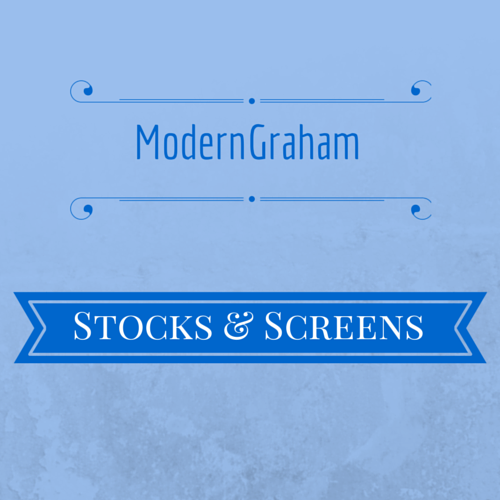 The next edition of ModernGraham Stocks & Screens is now available for premium subscribers! Inside this monthly PDF report and spreadsheet is a listing of all the companies reviewed by ModernGraham (currently 555 different companies) in a handy table with some key figures, including dividend yield information. It then proceeds to screen the companies regarding different topics. This is a great tool for your research into value investing opportunities. You can also download the raw data in a spreadsheet including each company’s rating regarding Defensive Investors, Enterprising Investors, or Speculative, the MG Value, the price as a percent of the MG Value, the PEmg ratio, the dividend yield, the beta, the current ratio, the Net Current Asset Value, the market-implied growth rate, consecutive years of dividend growth (not yet available for all companies covered), Graham Number (not yet available for all companies covered) and a link to the latest ModernGraham valuation! In addition, you can review ModernGraham’s Glance at the Dow, a valuation of the Dow Jones Industrial Average as a whole and its individual components! Also included in membership: Access to all individual ModernGraham valuations! With a premium membership, you can access every ModernGraham valuation of 555 companies. The ModernGraham approach is three-fold, and the new design will highlight that fact. This will enable you to conduct your research as efficiently as possible. Stage 1 looks to determine if the company is suitable for either the Defensive Investor or the Enterprising Investor; Stage 2 presents ModernGraham’s calculation of intrinsic value and gives some brief comments; and, Stage 3 provides some data to assist with your further research. In addition, a PDF version of the entire valuation is included and can easily be printed for your quick reference. This PDF has all of the information from the valuation, from the Stage 1 analysis to useful links for research purposes. But don’t just listen to what it includes – take a look for yourself! Here’s a free sample valuation! ModernGraham has always utilized ten years worth of financial data when calculating the intrinsic value of a company. Now, we download twenty years worth of data in order to provide you with more historical context. This means that we can look back on the company to calculate the intrinsic value for up to fifteen years, giving you an opportunity to compare how the company’s price has moved in relation to the intrinsic value over time. Download the September 2014 PDF or the September 2014 spreadsheet. Register through this page, following the directions to pay. Acceptable payment options are Visa, Mastercard, American Express, Discover, Paypal, and more. Once your payment is complete, visit the Subscriber Content page to access the issues. When you return later, you can login to your account here. With so much talk about stocks being overvalued, I’m glad to find someone that helps with the legwork of determining value investments. When the downturn occurs I feel confident ill be better prepared than most. I purchased your March screens and am looking forward to April. Thanks. Excellent modernizing application of Graham’s life work. Thank you! I just discovered your web site and find it intriguing. I inherited some div stocks 20 yrs ago and just recently decided to reallocate using “Seeking Alpha as ” as a tool and discovered a whole different world. And now with MG further frontiers seem to be unfolding. I’m looking forward to spending my mornings with MG and making my investments with sound tried and true, (and profitable) assistance. History shows that people who save and invest grow and prosper. ModernGraham gives us the knowledge and wisdom to help us invest wisely in order to grow our investments. Invest with knowledge on your side. ModernGraham provides that. Before I buy a stock, I always check first to see if MG has evaluated it. Buying within your criteria for a defensive investor, I always feel that at a minimum, I will be able to sleep at night and very possibly earn a handsome gain in the process. Thanks for helping me plot an even course through all the “vicissitudes” and profit from Mr. Market’s emotional ups and downs. Keep up the great work! Since I’ve been using Modern Graham’s recommendations my portfolio is moving into the black! I thoroughly recommend this service as a way to improve buying choices in a volatile market. If you are unhappy with your subscription for any reason, please send an email to ben@moderngraham.com to cancel. If immediate cancellation is requested, a refund of the most recent month’s subscription fee will be issued. If you would like to simply cancel at the end of your current billing cycle, the recurring payment will be stopped. *As always, ModernGraham makes no recommendations for investments in specific situations. Please consult a registered broker or investment advisor regarding your individual investment decisions.